week 1 goal met – charity work done! I love to do charity work, especially when it involves quilting. I get such a warm and fuzzy feeling inside when I do something that I know will help someone in need. I know a LOT of other quilters that are very generous with their charity work as well, so I feel right at home in this profession. 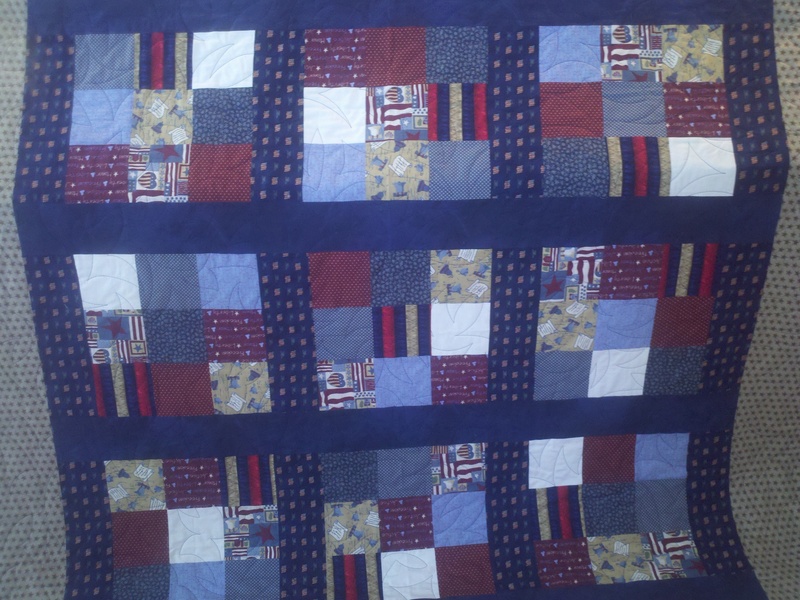 One of my favorite ‘charity’ groups to donate my time to is Quilts Of Valor Foundation (http://www.qovf.org/). As a veteran, I understand how lucky I am to not have trod the sand, slept in desert heat, fired my rifle at anyone or come home missing body parts. So if I can do one thing that I love to do, AND help out someone that gave their time and well-being to protect ME and my fellow citizens, well then, I want to do that! The process is pretty cool actually. Someone, or a group of people (I’ve had quilts come from a quilting bee) make a quilt top and use the website to have it directed to a longarm quilter, like me. They send the quilt back and top to me, and I add the batting and quilt it, in whatever style and color I want to use. Many of the quilts are patriotically themed. 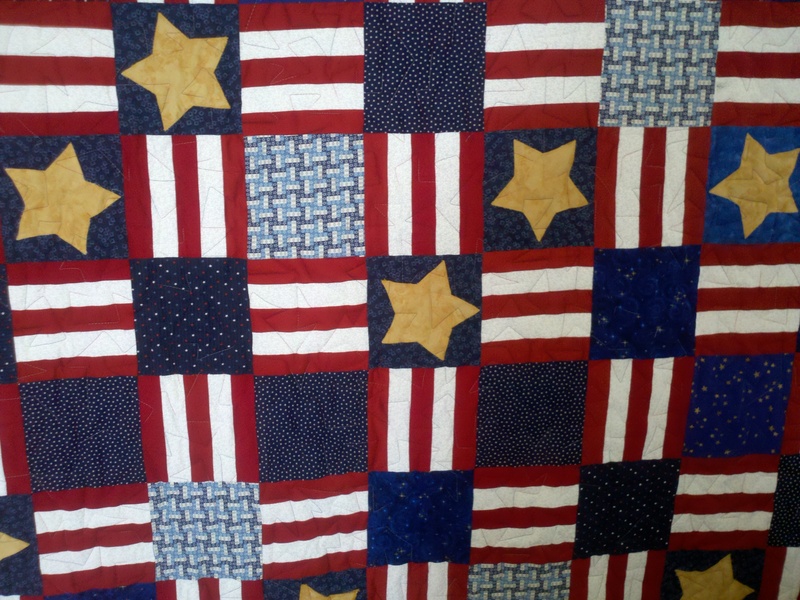 Lots of red, white and blue quilts, quilts with stars, or military panels. Sometimes the quilts are just completely different, which is nice too. The quilt I finished today was one of those – it does have a pattern of opposing light and dark stars, but the darker fabrics are scrappy and very small, which makes for a beautiful, classic look. With this pattern, I wanted to use my variegated blue/white thread and quilt swirls over the stars. Doing a rounded quilting pattern on a quilt top pattern that has more angles can create a unique visual effect. Well, I like it anyway. Hopefully the recipient will also. From there usually one of two things happens. Sometimes I trim and bind the quilt, then wash it per the instructions of QOVF and send it on to wherever they tell me to. One I’ve sent off to Germany, one to Los Angeles and I think one to MD. Most of the time the quilt maker wants me to send it back to them and they take care of that aspect and have it shipped to the final destination. Along with the quilt I send pictures of my studio and a short letter telling them about me and my family and the process that creates their quilt. The quilts all go to veterans of war. They all go to someone deserving. The trouble is that there is ALWAYS a greater need than there is supply. I have received quilts from both coasts because there is a shortage of longarm quilters that participate. If you go into any quilt shop, you will find information of some sort regarding charitable causes. Project Linus, Quilts For Kids, and Quilts of Valor are some very popular organizations. Click here for a list of other charities that could use your quilting help! Quilts of Valor is popular with ladies interested in supporting our military members in particular. It is a simple process really. You sign up on their website, letting them know what you are interested in doing for the project. When they need you, they send you an email, letting you know who your partner is and providing a link to information about the project. I have participated in three so far, over the last six months or so, each time being the quilter. 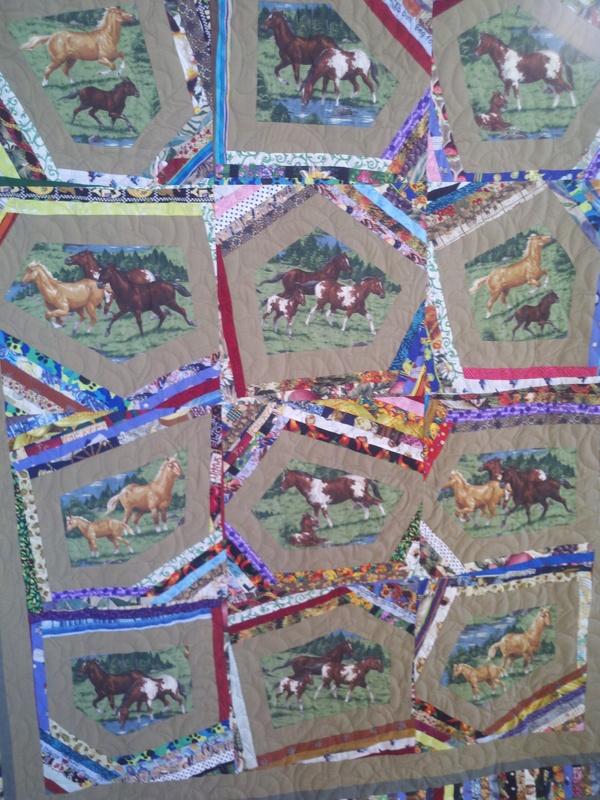 For the first project, the quilt maker chose to assemble a string quilt (foundation pieced) with pentagon shaped horse panels in the center of each block. With most QOV quilts, it is safe to assume the quilt will go to a male, so the quilting patterns I choose from are a bit more limited. I decided on a baptist fan pattern, which did nicely to complement the quilt without accentuating the angles any more. I then bound the quilt, attached the label, washed it, filled out the destination form and mailed it as directed. This one went straight to a military medical unit overseas. The second project was a red, white and blue quilt, and I did a simple angular quilting pattern to mimic the stars in the fabric, using variegated thread on the front and back. The quilt maker requested I send it back to her to bind and mail. The third quilt is again a red, white and blue, and I tried a new quilting pattern, again with variegated blue and white thread on the backside. This one I will bind and send to the quilt maker for her to ship, per her request. We also create journals to go with the quilt. It’s more of a letter or log, from the quilt top maker and the quilter, with pictures (if possible), but the purpose is to inform the soldier of how the quilt came about, who was involved in it and the process of making and quilting it. It’s really a nice touch. This is a great charity to be involved in, especially if you have a busy schedule and want to support our combat veterans. And it’s a wonderful way to get to know others that share this wonderful hobby! Happy quilting my friends! This girl has been BUSY!